Microsoft used automatic updates to deploy security patches to your PC. Security patches were an essential way of helping to protect your PC against malicious activity from hackers, as well as protection from exploitive coding. Yes, there are going to be some costs involved. 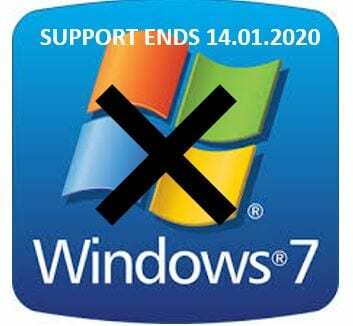 If you are still running Windows 7 it is highly likely that the PC you’re using is several years old. Old devices cost your business time and money. From experience it would be more cost-effective to buy a new PC running Windows 10 as opposed to buying the software. Purchasing a new PC running Windows 10, you not only receive the very latest Operating System, you will also have new hardware covered by a Manufacturer’s Warranty. Invest in faster, smarter and more secure Windows 10 devices today. Basic requirements for installing Windows 10 on a PC, are below. If your device does not meet these requirements, you may not have as great an experience with Windows 10 and might want to consider prior to buying a new PC. Internet Connection: Internet connectivity is necessary to perform updates and to take advantage of some features. Windows 10 Pro in S mode, Windows 10 Pro Education in S mode, Windows 10 Education in S mode, and Windows 10 Enterprise in S mode need an internet connection during the first device setup (OOBE) as well as either a Microsoft account (MSA) or Azure Activity Directory (AAD) account. Is there anything else that I should consider? Yes, you should list all the Applications which you use on your PC. You need to ensure that these will be compatible with Windows 10 and you have all the necessary installation media available. When I upgrade which features will be removed? If you have Windows 7 Home Premium, Windows 7 Professional, Windows 7 Ultimate, with Media Centre and you install Windows 10, this will be removed. As part of installing Windows 10, Desktop gadgets of Windows 7 will be removed. Home Users of Windows 10 will have updates from Windows Update automatically available. Windows 10 Pro and Windows 10 Enterprise users will have the ability to defer updates. If you have Windows Live Essentials installed on your system, the OneDrive application will be replaced with the inbox version of OneDrive. Is Amshire using Windows 10? Our entire office upgraded to Windows 10 awhile ago and we’ve not met any issues or problems since. Everything appears to run just as well as it did on Windows 7 and 8. With Windows 10 Microsoft reintroduced the famous ‘Start’ button.